Produced by a fourth generation family business using a unique breed reared in the north of Italy on a selected diet of cereals and grains. Our selection includes Prosciutto di Parma, the classic Italian ham made only in the Parma province; tender and succulent Coppa, made with pork neck fillet and flavoured with garlic; and Salame Brianza, seasoned with wine, peppercorns and garlic and matured for 90 days to develop its rich, savoury flavour. Serving suggestion: to appreciate the full flavours, please remove the pack from the refrigerator and open 30 minutes before serving. Waitrose have selected assured farms in Italy demonstrating exemplary standards of animal welfare and traceability. Prosciutto di Parma matured for a minimum of 20 months, with succulent Coppa and slowly aged Salame Brianza. From pigs reared on Waitrose assured farms in Italy. Produced by a fourth generation family-owned business using a unique breed of pig reared in the North of Italy on a selected diet of cereals and grains. Our selection includes Prosciutto di Parma, only made in the Parma province; tender and succulent Coppa, made with pork neck fillet and flavoured with garlic; and Salame Brianza, seasoned with wine, peppercorns and garlic, and matured for 90 days to develop its rich, savoury flavour. 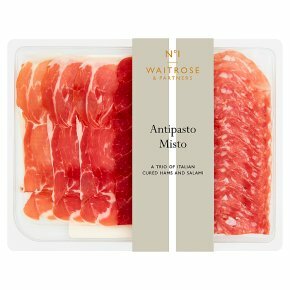 ……Waitrose have selected assured farms in Italy demonstrating exemplary standards of animal welfare and traceability. INGREDIENTS: pork, salt, white wine, corn dextrose, peppercorns, antioxidant sodium ascorbate, pepper, preservatives potassium nitrate, sodium nitrite, garlic. Prepared with 138g of pork per 100g of product. Moisture is lost during curing and maturation. INGREDIENTS: pork, salt, corn dextrose, antioxidant sodium ascorbate, flavourings, preservatives sodium nitrite, potassium nitrate, garlic.